The Berryman B-12 Chemtool is a product line that has a very long and proud history. Developed in the 1950’s, it quickly became one of the industry’s leading cleaning solvents. 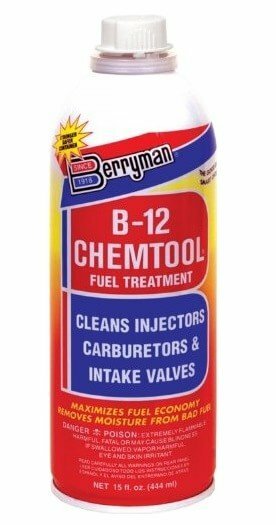 The Berryman B-12 Chemtool Carburetor/Fuel Treatment and Injector Cleaner is a state of the art product that uses the Berryman exclusive HEST or “High Energy Solvent Technology”. 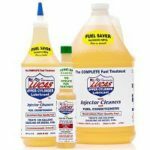 This technology is designed to pack a real punch when it comes to cleaning gasoline fueled motor parts; none of those weak mineral spirits or kerosene that many other products use. Unfortunately, due to the strong nature of this solvent, this B-12 product is unsuitable for use in Diesel Engines and can degrade their performance. It’s clear that if you want to rid your gasoline engine of dirt and deposits, even if they’ve been piling up for years and years, the B12 Chemtool will work wonders. Just be careful not to spill any on the paint job or on yourself, this stuff doesn’t kid around. It’s also wise not to exceed the recommended dosage when adding it to your fuel. Remember that this is a very strong solvent that could potentially damage plastic components in your fuel system when undiluted. Excessive use of this product in high concentrations may be harmful to your vehicle! Do not use with Diesel Engines! 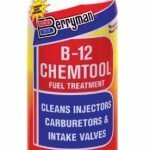 The Berryman B-12 Chemtool is a product designed to clean even the most clogged up fuel injectors and other parts of the fuel system. The patented super strong solvent is so potent that you actually have to be careful not to use too much and that’s saying something. However, please note that this product is designed to be a true “cleaner”. Unlike some other products, it does no aim to specifically improve your fuel and shouldn’t be used as a constant fuel additive for that reason. Like suggested on the label, use this every 2500-3000 miles or every oil change. On another note, this means that you can use other fuel treatment products the rest of the year and achieve an even greater engine efficiency and life-span. Excessive use may damage engine components. That statement is false! As long as you follow the manufacturers directions, you will have no problems. And your statement is contradictory. Excessive use means using more than the recommended amount, which means you are not following manufacturer’s directions. If you are following it, then it’s not excessive usage is it. No, This product is safe even if you over dose. I’ve been using this product for more then 15 years. I’m a Chemtool master. Yes, as long as you follow the 1oz. per gallon directions. Is this cleaner B-12 OK to use on hybrid engines ? as long as it’s a gasoline hybrid, and not diesel, i think it should be fine. Stick with your premium fuel, if your engine requires it. Chemtool can still be added. should this be used in new cars???? As long as it is a gasoline engine. If you have a problem with the directions, you can add less then directions specify. 1oz per gallon is recommended. If your tank is 15 gallons then only add 11 or 12oz. Go from there. Can it be used in 2 cycle engines? Is the B-12 Chemtool suitable for two cycle engines – – don’t want to damage my carbuerated Yamaha 150 outboard? Yes, but the 1oz per gallon rule does not apply. Unless your gas tank can hold a gallon. Can B12 be used in combination with Marvel’s Mystery Oil? marvel oil gunked up my injectors and had one cylinder of my 88 jeep 4.0 with only 95 lbs compression. new injectors and many cleaners later she puuuurs at 160000 miles – i used techron sea foam bg44 and berrymans b12 has it running the smoothest of all. i disagree that mystery oil will foul injectors,i been using it for years no problems.. I would not mix them together. Marvel’s is like an oil and Chemtool is liquid that can dissolve Marvel’s Oil. Please explain: use 2 cans. What size can. Does anyone know how long this stuff takes to evaporate water from bad gas? When should the car start running good again? My 2010 Subaru legacy has 130k miles on it. The last 6 months I was getting 32 mpg average. After adding B12 chemtool, my first tank full went up to 34.5 mpg. half way through second tank I’m getting 34 mpg and my throttle response is improved. Really great bang for the buck.